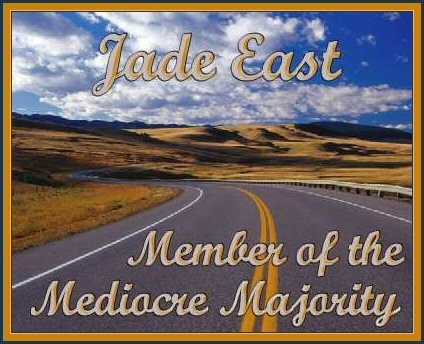 Jade's stories are mostly Voyager J/C fan fiction and are all rated G or PG. Jump to new stories. Leaning is a short story inspired by the movie While You Were Sleeping. Infinite Kisses - Chakotay cannot wake up from a pleasant dream. This story was entered in the Purple Comet Illness contest. What is it? 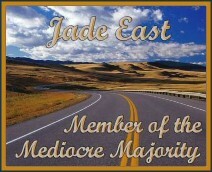 Jade's first drabble. Future Dreams - Chakotay is in danger of falling for another Kathryn. This story won second place in the Purple Comet Time Travel contest. Legendary Conspiracy is a joint effort with two co-authors, was an entry in ALM_Voyager's Voyages Home J/C Fan Fiction Contest. A Broken Promise - Kathryn falls for another man and breaks her promise to Chakotay. Blue in Hawaii - Voyager returns home, but Captain Janeway isn't happy. I Have All, But One Thing . . ., Jade's second drabble, won the award for Best Overall in the JetC23 Drabble Contest. Cross Walker - Chakotay gets to know a nice ensign, who introduces him to the title character (200k). A Day in the Park - Kathryn and Chakotay have to change their plans for shore leave. This story was entered in the Purple Comet Shore Leave contest. Quintessential Friends go shopping for a Big Event. Bygones - When nightmares plague Captain Janeway, Chakotay offers advice and comfort. This story won third prize in the Purple Comet Coda contest. Epiphany - Captain Janeway has an epiphany. England Swings - A lower-decks romance blossoms. Second Epiphany, the companion story to Epiphany, tells Chakotay's side of the story. No Mere Fantasy - Jade teams up with Consy for this a J/C story. Layered Logic features one rainstorm, two friends, and a logical conclusion. A Moment of Clarity - Janeway and Chakotay wonder why they've been confined to quarters. This story was a winner in the Koffee Klub Picnic Prose Prize contest. Sands of Decision is a drabble written for the Koffee Klub Picnic Prose Prize contest. Hope - Will J/C spend Christmas trapped in a turbolift? Little Sacrifices - The aftermath of Captain Janeway's time on Quarra requires adjustments for both her and Commander Chakotay. 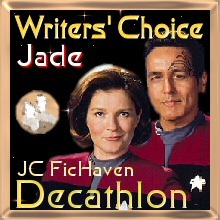 Over the Threshold - Certain crewmembers break warp 10 and win second place for Romance in Ripples in the Pond. Human Interaction - Seven of Nine explores her humanity and encounters a level 10 authorization impediment. How will she proceed? 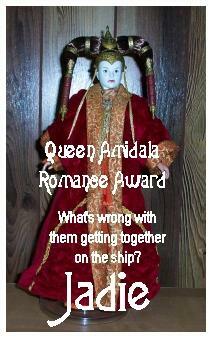 Second place for Romance in Ripples in the Pond. One Time Too Many - Kathryn has a rule about dancing with Chakotay. BRADfic - Jade gets writing help for Beta Reader Appreciation Day. No Walls - a haiku. Jade's poem is Untitled. 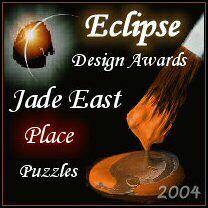 It inspired a story by Eitak and Ekein called Jade's Poem. To be notified of updates to this site, sign up at Yahoo! Groups or send email to the address below.